G.L. Huyett is unique in the breadth of its manufacturing operations and product offerings. We proudly manufacture or source a wide-range of hard-to-find products from around the globe to make it easy for you to get what you need. Our manufacturing capabilities are complemented with a state-of-the-art, world-class warehouse featuring over 95,000 non-threaded fasteners and industrial components. Our experienced lathe operators can turn, face, groove, or part complex parts with tight tolerances including the formation of a head (clevis pins) or radial grooves (headless pins). Multi-tooled turrets can be configured to drill transverse holes, bore internal holes, or ream straight, tapered, or cylindrical holes. In order to guarantee precise tolerances for your parts, G.L. Huyett offers surface grinding – a machining process in which abrasive particles, bonded to a grinding wheel, remove small amounts of material from a workpiece. Your parts are held in place magnetically to assist in efficient and streamlined production. Stamping, also referred to as punching, is a process of using a hydraulic press to punch through material and into a die to create a hole in the workpiece. Generally, more than one part can be punched in a single stroke for higher volume applications. A progressive set of dies can also be used to form more complicated designs. Want your parts personalized? G.L. Huyett has automated inkjet printing and engraving capabilities that mark (print) your name or part number directly onto your finished parts along with dimensional information using RoHS compliant ink. Finished parts can also be bagged or boxed with your company's branding in quantities of your choosing. After being machined, parts are tumbled to tight tolerances before being cleaned and dried. The cleaning and drying process also introduces rust inhibitors that extend the shelf life of plain finish parts. Additionally, G.L. Huyett’s employees wear gloves to prevent exposing finished parts to oils and impurities. Many parts such as cotter pins, hitch pin clips, rings, and hooks are manufactured using a process called wire forming. Round, square, and shaped wire may be pulled through dies, extruded, bent, or coiled to suit your needs. We offer hundreds of standard wire forms or can customize to your specifications. Good for short runs where tooling costs can be prohibitive, lasers use a high-energy beam supported by a coaxial supply of cutting gas to melt, vaporize, and/or combust material in a small and concentrated area. Lasered parts are generally flat – such as washers – but parts can also be bent at angles following laser work. Forming reshapes a workpiece without adding or removing material by rolling, extruding, die forming, forging, or indenting to create roll splines, gears, worms, and threads. Parts may also be broached using a toothed tool to efficiently remove and shape material on a lathe or an arbor press. Centerless Grinding is an abrasive machining process used to remove material from a workpiece efficiently to produce a high volume of parts in a short time. Material, supported by a blade or work rest, is passed between two rotary grinding wheels without the use of a spindle or fixture to secure the workpiece. G.L. 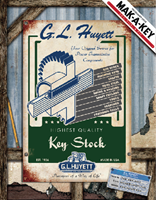 Huyett utilizes metal-cutting band saws to make precise, uniformly cut keystock and machine keys to tight tolerances. 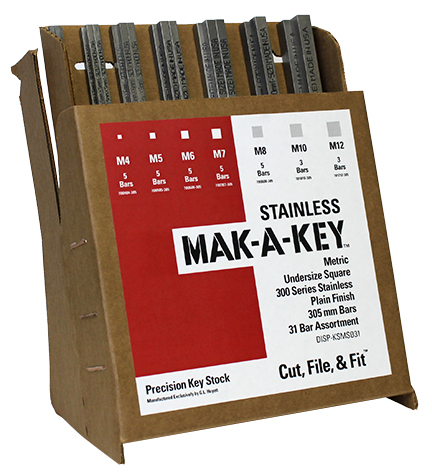 We have the world’s largest selection of 1’, 3’, and 12’ lengths of keystock in plain carbon or zinc plated steel, special grades, and non-ferrous material up to 3” square. Milling is used to shape or modify the tolerances (dimensions) of parts, to install steps or cutouts, to drill and tap holes with exacting precision, or to deburr parts. In fact, any process that uses a rotating cutter can be performed. We offer an extensive range of tooling, tool holding, and insertion options capable of producing just about anything. Looking for a custom solution? Take a look at our Manufacturing Line Card to see what else we can do for you.